Bad food habits can be hard to break, and more often than not, the worst habits—the ones that become comfortable routines—often form at an early age. As parents, it is important to understand this and proactively try to keep your kids from developing unhealthy habits is key. 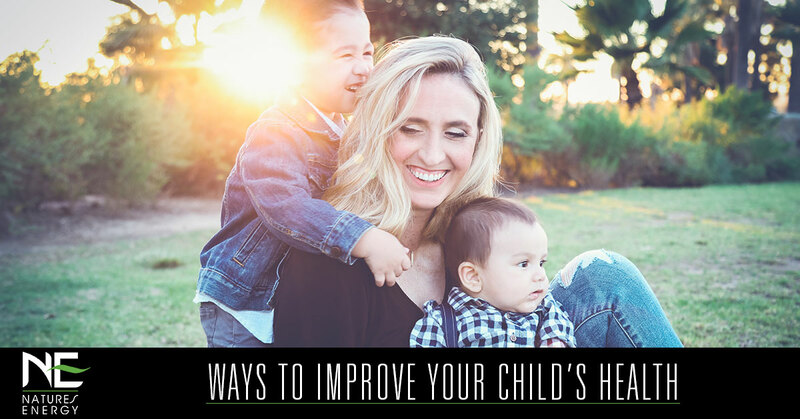 In today’s blog, we at Natures Energy would like to offer some time to help not only create good eating habits but ultimately help your kids improve their health. At Natures Energy, we specialize in nutraceutical manufacturing and in the production of high-quality vitamin and mineral supplements. From children’s vitamins and minerals to prenatal vitamins, we have an array of all-natural supplements that can help you and your children achieve their optimal health. Shop our all-natural supplements! Below are some suggestions to help your kids develop healthy eating habits. Junk food is addictive. It’s no secret. Once kids have their first big bite of some crunchy junk food, it can be hard to get them unhooked. However, this isn’t to say you should entirely ban those foods from their diets. By banning foods completely, you can actually increase their desire—kids are almost always more tempted to have what they aren’t permitted to. The best approach is to enforce moderation and do your best to create healthy relationships with food, including junk food. As we mentioned, you don’t have to completely ban junk foods to keep your kids healthy. But when buying these special treats, buy smaller packages. For example, rather than buying a two-gallon bucket of ice cream, instead, opt for a pint. And if you do buy massive, bulk-size unhealthy foods, store them out of your kids’ reach. Don’t give them unlimited access. This will prevent them from overeating junk foods and mindlessly snacking throughout the day. Though many schools are pushing for healthy menus, there are still many available lunch options that are far from ideal, especially if eaten every day. If your child’s school provides a lunch menu, print it out and review it with your child. In a non-disciplinary way, encourage them to pinpoint the healthiest options. This practice can help teach your kids how to make nutritious decisions. Additionally, if you notice that your kid spends his or her leftover lunch money on candy and soda, encourage them to instead put that money in a piggy bank and spend it on some non-food items—maybe a toy or game or Natures Energy liquid vitamins for toddlers! Fostering physical activity from a young age is essential to the foundation of a healthy life. Take advantage of every opportunity you can to get your kids outside and up and moving. Not only will this help you get kids active and exercising, but it will also help your child get a healthy dose of vitamin D from the sun—a vitamin that is essential for developing healthy bones and bolstering up the immune system. Having your kids help in the process of planting a garden can have a number of benefits. Firstly, it allows you to spend some quality, fun time with your kids, getting dirty and learning about the process of gardening. Additionally, if they have participated in the planting process, they will likely have more of an attachment to the veggies that they help to grow and will, therefore, likely be more inclined to (at least) try the veggies they helped bring to life. It may seem obvious, but it can be easy to forget. Children are sponge-like copycats. Though teenagers can sometimes go through stages where all they want to do is the opposite of what their parents do, younger kids are quick to mimic the behaviors of their parents. Take advantage of this monkey-see-monkey-do behavior and choose to eat healthily and be healthy. Though you might think it’s not having an effect, you may be surprised by what gets imprinted in their minds. When making dinner, try to limit starches and always include a fruit and vegetable. Today, with convenient fresh fruits and veggies available everywhere, it is now easier than ever to make sure it’s a part of every meal. If your child is like most—picky about foods—try including them in the preparation process. Similar to planting a garden, having your child help in the cooking process can pique their curiosity and almost trick them into being healthy. It can seem a bit unnatural to tell kids that it is okay to not finish everything on their plate. However, if their plate is overloaded, don’t make them eat it all. Recognize when kids are full. If they haven’t eaten much but say they are full, let them be finished—with that said, however, don’t let them move on to dessert or any other junk foods (this tip obviously needs to be taken with a grain of salt and can vary on a case by case basis. The important takeaway is to not foster unhealthy eating habits.). No one would disagree with the claim that it’s important that children receive the nutrients and vitamins that they need. However, accomplishing this is much easier said than done, as most parents know. Not only are kids extremely picky when it comes to eating, but parents are often too busy or pressed for time to make sure their kids are adhering to diets that represent all food groups. This is why it is important to make multivitamins a daily part of your kid’s life. The best multivitamins for kids will fill these nutritional gaps and guarantee that they are getting all they need. Our liquid vitamins for toddlers, for example, help your child get 100% of their RDA for twelve essential vitamins and 74 trace minerals with just one ounce daily. Check out our online vitamin shop for all of your children’s vitamins and minerals. Best-known select natural vitamins, organically sourced plant-based minerals, providing important micronutrients that can optimize total body health.